Federal Express Residential is our default shipper for gowns and shoes. For smaller items or remote locations, we may elect to use USPS Priority Mail or 1st class mail. Please note that USPS shipping is NOT a delivery time guaranteed service. If your order is time-sensitive or requires delivery by a certain date, please choose Federal Express 2nd Day or Next Day shipping method instead. Based on our experience, 90% of USPS shipments will be delivered within 1-4 business days. The USPS does not provide detailed tracking for your package. International shipments will incur additional custom charges. International purchases must enter their destination address for shipping rates as they vary for each country. Please email or call our internet sales department when your shipping location does provide default ship methods or costs. We will quote you a rate. Bridals by Lori does not control duties and is not responsible for any fees you may be billed by the shipper. Additional fees will be collected by the shipper and are not reflected in your online order. Please visit the Federal Express site for more information about international shipments. Local Pick Up Policy: Our internet department is open Monday-Friday 10AM-4PM. We are not open weekends and closed most major holidays. Please call or email to schedule an in-store pickup. This is to ensure the item has arrived and has NOT been shipped to you. Georgia requires we collect sales tax on ALL orders picked up in our Atlanta store. Georgia sales tax will be immediately collected on in store picked up orders if not originally collected. Transit times are based on Fedex Business Days. Shipments do not move on weekends or Holidays. 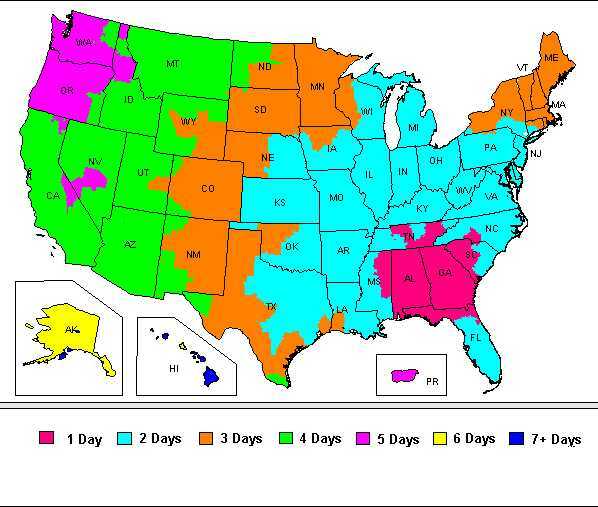 The map above is a general representation of transit times for FedEx Ground shopments to commercial destinations. In limited areas, transit times may differ between shipments to commercial and residential destinations. For specific transit time information from one ZIP/Postal code to another, please go to Get Rates & Transit Times under the Ship tab on fedex.com. Fedex Ground business days are Monday through Friday (excluding holidays) FedEx home delivery business days are Tuesday through Saturday (excluding holidays). What is the best shipping address to use? It is best to use a work address where someone can sign for the package. A signature may be requested when shipped to a residential address for an additional charge. What if I need to change a shipping address? You can change a shipping address at any time prior to the order being shipped to you. Email a request shipping address change to : [email protected] . If any of the shipping addresses provided for shipping is not a valid address an additional charge will be incurred because FedEx or UPS will charge an additional fee to redirect the package. In such a case, the customer will owe for the additional charges. Should the customer move and fail to notify us of the new shipping address before we ship the order, the shipping service will charge additional fees to redirect the package. In such a case, the customer will owe for those charges.